In 1972, Beth Milliken's family literally stumbled upon some of Napa Valley's most sought-after land for winemaking. When Milliken was 11 years old, her father—an emergency room doctor—made an impulse decision to move his family from Southern California to the entirely undiscovered Napa Valley. Land prices were about $4,000 an acre (now they go for around 100 times that), and Beth, along with her parents and four siblings, settled into a 45-acre estate called Spottswoode on the western edge of St. Helena. Go to Fortune to read about how Beth—now the president and CEO—seized the opportunity with her mom and went on to become the first female president of the Napa Valley Vintners. Here, find out more about her organic practices and best Napa picks. Why has organic farming been so important to Spottswoode/your family? Organic farming was something that [our first winemaker] Tony Soter was interested in. In 1985, he presented the idea to my mother, and it had to have sounded like voodoo to her. She was born in 1932, and she is 82 today. She trusted him, and she was willing to do it. For us, I think it's because we were stewards of the land and we intended it to stay in our family. We have 45 acres but in a residential neighborhood. We wanted to be good neighbors. It started out as an interesting idea, and it's really something that we are deeply passionate about. We don't sell our wines as organic or market them that way, but we definitely talk about being organic, and we are really proud of it. In this day and age, with everything going on with global warming, to farm any other way seems crazy. It is incredible to me that most people still farm with chemicals, and I am astounded that there is not more enlightenment on what we can do. You're known for Cabernet Sauvignon; what's your favorite pairing? With Cabernet like ours, a nicely grilled steak is just perfect. I'm not a huge meat eater, but I love a nice organic New York steak cut into strips. Really simple—just olive oil and salt and pepper. 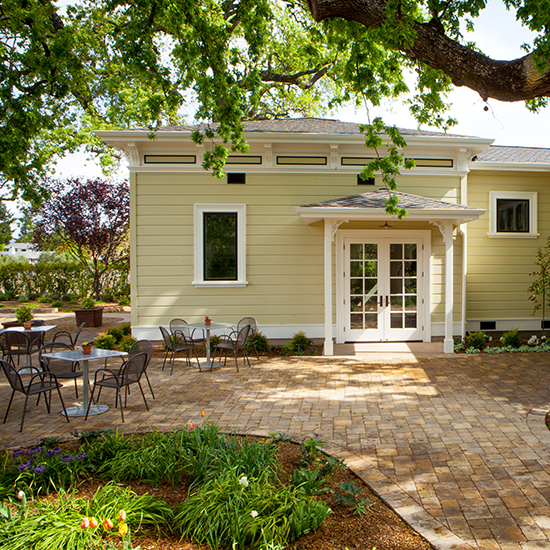 When you have a day off, where would we find you in Napa? Out in nature. I'd be on my mountain bike; I end up having to ride on the pavement a lot. So I like to climb mountains and be away from cars. I do a lot of hiking in the hills behind my house. I like to be by myself, because it's my time for me. Where's the best hike in Napa? A park up on Howell Mountain. Skyline Wilderness Park is also a great place for hiking. It's #FollowFriday! Who are some other female Napa winemakers that you really admire? Naoko Dalla Valle at Dalla Valle, Janet Pagano at Ovid, Eileen Crane at Domaine Carneros, Cathy Corison from Corison, Helen Keplinger of Keplinger Wines.